Sling trainers of the brand 4D Pro feature flexible resistance tubes, also called lambda tubes. Like the name of the brand indicates, you can train in four dimensions with this sling trainer and experience a holistic, new training. The big surfaces of the sling trainer offer a good stability, no matter whether you hang in the slings with your arms or legs. The new 3 in 1 system of the 4D Pro sling trainer 3.0. In just few steps you turn your sling trainer 3.0 into a tractor unit. Without using the 4th dimension (elastic lambda bands), you get a classic, stiff sling trainer. The 4D Lambda tubes Version 2.0 are the perfect completion for your 4D Pro Reaction Trainer. The elastic tubes train muscles more efficiently and support the balance. Adjustment possibilities of the sling trainer are part of a good equipment. Furthermore, additional fixing possibilities and appropriate accessories, i.e., training dvds and training posters, are further features of the equipment. Handling of a sling trainer should be as easy as possible. Versatile usage possibilities, easy storage possibilities, and easy use of the sling trainer are important. 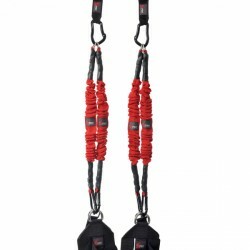 The quality and lifespan of the used materials are important criteria for sling trainers. Materials the most sturdy possible with a low wear is ideal for optimal training conditions. Sling trainers offer a multitude of exercising possibilities. 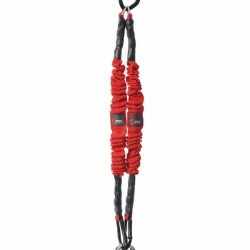 The more training variation a sling trainer offers, the more ideal it is. Exercises with sling trainers can be done as fixed or elastic training.